Jay Martin has been a serious boater all of his life, starting out with a "Sport Yak" that was a plastic row boat, sail boat and motor boat. During his teenage years he was a water skier and was the "Waterfront Director" at the local YMCA camp. As an early adult, he took an interest in larger vessels. Building his experience, people started asking him to help them with their boats. Pretty soon he was delivering 50' plus vessels up and down the Tenn-Tom Waterway. He went to Sea School and fulfilled the requirements to become a 100 Ton Near Coastal (100 miles offshore) Master Pilot and received all A's on the required tests. He has delivered Yachts up to 98' from Lake Michigan down the Tenn Tom Waterway to South Florida, including trips through the Okeechobee Waterway and around Marathon Key up the East Coast to Virginia Beach. He brings along his own Laptop Computer and portable GPS system that provides totally self contained navigation equipment. Well versed in electronic and marine equipment, he can do minor repairs on many onboard systems. If you are interested in moving your boat to a new location or would like an experienced captain to go along with you, call 256-760-7787. Jay also believes in his community. He has served as officer and on several boards including; The Florence Civitan Club, NW Alabama Cerebral Palsy Center, Downtown Florence Unlimited, United Way of NW Alabama, YMCA of NW Alabama, Edgemont United Methodist Church, Commodore of Turtle Point Yacht and Country Club and volunteers at many other organizations. He also believes in supporting local business as opposed to national chains since most community support comes from local businesses. With involvement in boating, he found the opportunity to help people with selling boats. 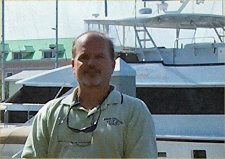 In just a few years he has sold several boats and created many lasting relationships with his clients. His motto is "integrity and satisfied clients are way more important than commission".